- San Francisco is built on 43 hills. 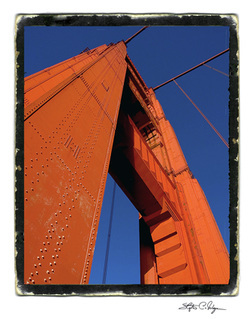 - The real "Golden Gate" is the strait that the Golden Gate bridge spans. It was first named "Chrysopylae," meaning "golden gate," by Captain John C. Fremont in 1846. - The first constructed street was Grant Street, originally named "Calle De La Fundacion". - The crookedest street is not Lombard Street, Vermont Avenue between 22nd and 23rd on Potrero Hill is the "crookedest." - Filbert Street between Hyde and Leavenworth is the steepest street at 31.5 degrees. - Broadway is wider than most San Francisco streets because it was the principal route to the docks. - Washington Square Park at Columbus & Union is not actually a square because it has five sides. But then North Beach isn't a beach and the statue in the middle of the park is Ben Franklin not George Washington. - Alcatraz means pelican in Spanish. The rocky pelican's island was a military fort before it became a prison. - Alcatraz Island has no natural water or vegetation. - Angel Island was a Nike missile base during the 1950’s & 1960’s. - San Francisco has 215 historic landmark buildings, ten historical districts and 14,000 Victorian homes. - In 1776, the Lake of Our Lady of Sorrows covered the area now bounded by 15th, Guerrero, 23rd, & Harrison Streets. - Telegraph Hill drew it’s name from an electric telegraph station installed at it’s peak in 1850. - Opened in 1898, the Ferry Building tower was modeled after the Cathedral Tower in Seville, Spain. - The huge clocks on the Ferry Building tower stopped at the precise times of both the 1906 and 1989 earthquakes. - The Golden Gate Bridge was the longest span in the world from its completion until the Verrazano Narrows Bridge was built in New York in 1964. Today, it still has the seventh-longest main span in the world. - When completed in 1937, Treasure Island was the largest man-made island in the world. 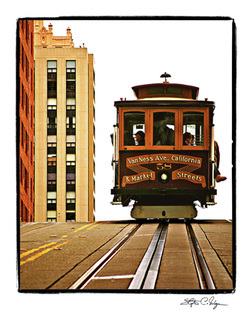 - San Francisco is the first and last city to operate cable cars. - San Francisco cable cars are the only moving National Historic Landmark, and 9.7 million people take a nine mile per hour ride on them each year. - The BART trans-bay tube from San Francisco to Oakland is 3.6 miles long. - Slot-machines were invented in San Francisco by Charles Faye. - The Conservatory of Flowers is the oldest building in Golden Gate Park. - Alta Plaza Park’s south stairway reproduces the grand stairway of the casino at Monte Carlo. - Denim jeans were invented in San Francisco for the Gold Rush miners who needed tough, comfortable clothing. - In 1850, gold seekers abandoned over 600 vessels in the bay. Some became landfill, now lying beneath the Jackson Square Historic District where the city's few surviving nineteenth century commercial buildings include Ghirardelli's first chocolate factory. - San Francisco is home to the largest Chinese community in the world, outside of China. - "I Left My Heart In San Francisco" was written by a gay couple, Douglass Cross and George Cory in 1954. - Tony Bennett first sang “I Left My Heart in San Francisco” at the Fairmount Hotel’s Venetian Room. - The Beatles gave their last live concert in 1966 at Candlestick Park. - Only 15% of the Asian Art Museum’s extensive collection is on display at any one time. - Known originally as the Cross City Race, the Bay To Breakers Race began in 1912 and never drew more than 125 runners before 1965.